All HylaFAX-Client Professional versions now support groups and users view! 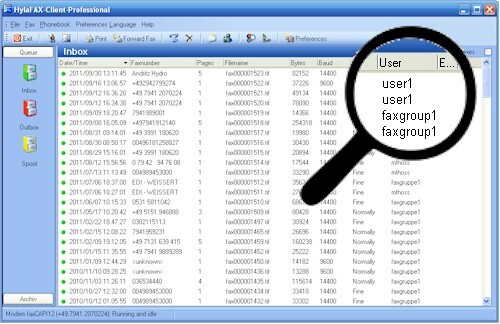 All HylaFAX-Client Professional versions are now capable of displaying only approved faxes in the Inbox and Outbox. It is only their own view faxes, or one or more groups. This can be managed locally on the Windows Desktop, or centrally on the HylaFAX- Server. There is NO additional install on the server required. It is also NO database required. Please just download this PDF to see how easy the administration. All installation routines install the necessary printer driver automatically! A license is NOT transferable to a other Windows System or other Hardware!